"The album cover is a very good visual representation what this album sounds like. 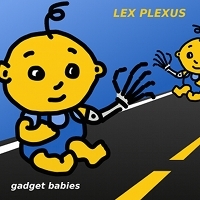 Those babies are damn clever to make such creative, fun, and complex music using a phone app. What sets this music apart from other electronic music is the chord progressions and meter changes. I always find it inspiring when a prolific artist manages to retain the same excitement, joy, and discovery as when they first began composing music. This music does not sound influenced by pop culture, the music industry, politics, robots taking over the world, the latest VST plugin, or anything else that typically distracts many artists from focusing on their craft. This is simply a collection of thought provoking compositions that will make you smile. :) "
"Dude. As the robot symphony laid eggs in my ear holes, machined dreams developed. Soundscaped holograms poured down like digital gunfire, unpredictably comfortable in their own chaotic grace. The album is decades of electronic soundscape, puréed into an army of melodicness. So many memories in it all, and still oozing futurism. It bends clocks." Available at iTunes, Bandcamp, CDBaby, Spotify, and many more digital distributors worldwide.